Will and Kim cover a baker's dozen of assorted spider remedies, combining formal materia medica study with illustrative cases to bring these remedies alive. This course will leave your skin crawling with unforgettable images of these fascinating remedies. Learn to recognize the Spider remedies in characteristic clinical settings. Cases bring out essential features of each remedy, as well as provide a deep understanding of the many facets seen in clinical practice. Tarentula hispanica, Theridion, Latrodectus mactans, Latrodectus haseltii, Latrodectus katipo, Aranea diadema, Aranea ixobola, Arenea scinensia, Tarentula cubensis, Mygale, Loxosceles reclusa and Tela araneae. Will is a research scientist, medical doctor and naturalist. He brings his expertise in botany and zoology to the description of the spiders we use in homeopathic practice. He encourages an in depth discussion of the classical homeopathic approach in materia medica study and case analysis. Kim is a dynamic teacher and a seasoned homeopathic practitioner. 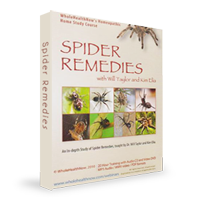 He will bring these remedies to life while focusing on important differentials between the spider remedies and other non-spider remedies from our materia medica. I would like to thank you for presenting many very interesting and informative courses, including the latest one, The Nightshades. It has been a wonderful learning experience, rich with colorful illustrations, and much stimulating information. I appreciate your efforts to keep costs down in continuing education in homeopathy. It is so convenient, and exciting to be gathered from all over the world at once enjoying homeopathy together on the web! I certainly hope you continue your courses, they are terrific! The Spider Remedies course is another in WholeHealthNow's ongoing At-Home Learning Series, offering high-quality, affordable homeopathic education.